Goddess of fertility, child birth final stages, and grain germination. She also was known for helping Khenmu on the potters wheel a kind of midwife role. Women often wore frog amulets representing Heqat during childbirth. She is also known ad the goddess of resurrection in connection with helping Auset with birthing Horu and her husband Wesir/Osiris coming back to life to impregnate Auset. 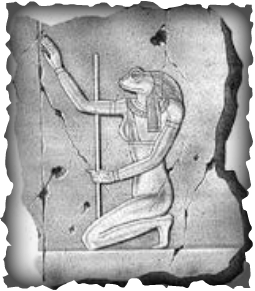 Women In childbirth wore a frog fetish representing Heqat siting on a lotus amulet with Greek words inscribed on the bottom and is to be worn in childbirth. Which was ruined since time immemorial. It only was called "House of Heqet,"
Then the goddess halted there. To make a monument there from that day. So that the water could not carry it off. And content her till she knew it was done.